Mod avaiable in english and italian. Making potions and using alchemy is more challenging. 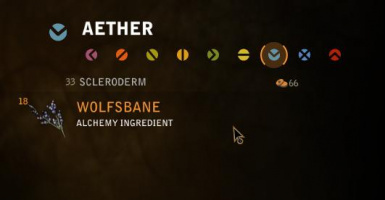 I find alchemy is to easy in this game, because there are to many ingredients which can be found in plants and monster and whoever can make more potions, bombs and oils then those in need simply using part of the ingredients he found. 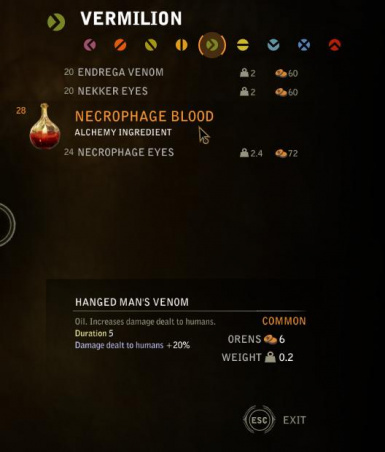 This mod change the alchemy type of many items in order to make alchemy more challenging. It also changes the formulas of potions, bombs and oils, so they need more components to be created. Vitriol, rebis, aether, quebrith and caelum can be found only in vegetal ingredients, each of these alchemy type is contained by two different plants. Vermilion and Sol are in common monsters ingredients, this monsters are nekkers, endriags, necrophages, harpias. 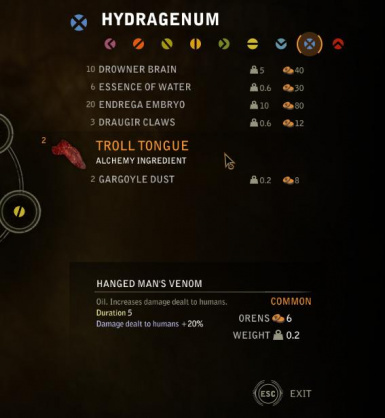 Hydragenum is found in rarer monster ingredients, like drowners, trolls, draugirs, bruxas, gargoiles. Fulgur can be found in kairan, draug and arachas ingredients, it also is in only one ordinary ingredient: wraith death essence. Many crafting components which were also alchemy ingredients are so no more and can be used only for crafting. Elemental stone, diamond and amethyst dust, nekker and gargoile hearths are some of these items. 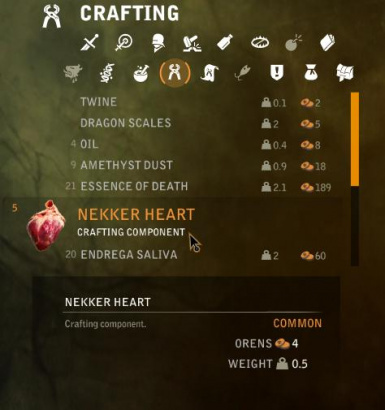 Moreover many other items which were both crafting and alchemy ingredients can be used for crafting no more, some diagrams have been changed to make this possible and some crafting components that weren't used in any diagram are now only alchemy ingredients. Drowner brain, harphy feathers and eyes, endriag embryo and venom and kairan tissue are some of these items. Potions, bombs and oil formulas have been changed and they need more components to be created, plants ingredients are needed for every alchemy formula, and rarer ingredients are required for stronger potions. For example thunderbolt, gadwall, lapwing and stammelford's philtre are the only potions that need fulgur. Copy the mod folder "items" in the folder CookedPC in the directory of the game. Then download the language file (is not strictly necessary but is recommended) and copy it in the CookedPC folder. Preserve the original language file of the game for uninstalling the mod. Delete the folder "items" or the files contained. Delete the language file of the mod and resume the original one, if you havn,t overwritten it. If you have already installed a mod which uses a file in the same folder used by this mod and to install this mode this file have to be overwritten there is a problem of compatibility. Overwrite the file if the mod you have is Mutagenology or DPPWAR because they are compatible with this one, else, look if the author of the other mod has written instruction about how to make it compatible with other mods.